The salvages continue with lighting and AV related equipment. Of course, some of this isn’t that useful nowadays, but it’s more interesting from a “wish fulfillment” and philosophical perspective. 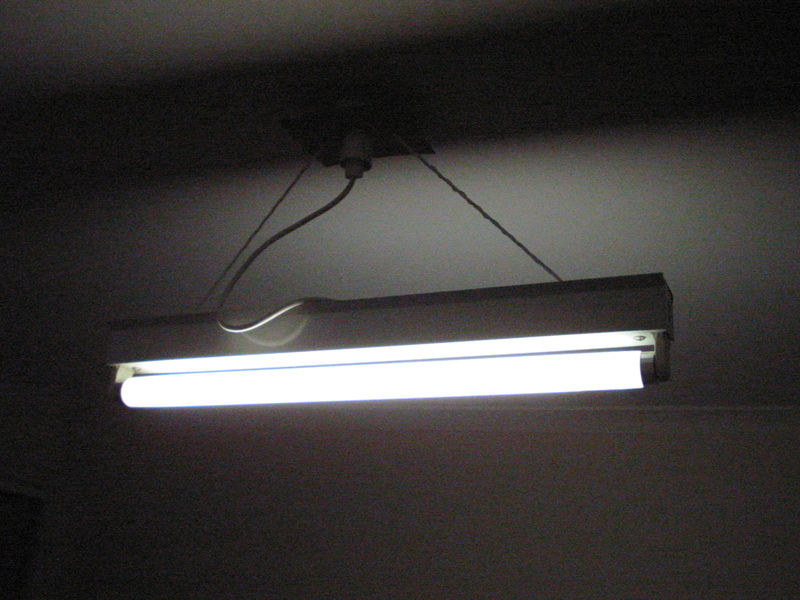 It’s no big secret that LED lighting has really hit the mainstream in a big way, and as people start to renovate their houses, the first thing that often goes are the linear tubular fluorescent fixtures – deemed too power hungry, noisy, flickery and ugly for use. Taking a walk around the neighbourhood, I had the choice of three different types of 36W fixtures – some single, and others double. There were multiple units of each, all of them using inductive control gear from Vossloh Schwabe or Clipsal, power factor compensated with original capacitors still intact and although slightly rusted and with ageing plastic, still in serviceable condition. Some were missing an internal reflector panel (such as the lower one) but came with diffuser, whereas others were never designed to take diffusers anyway. 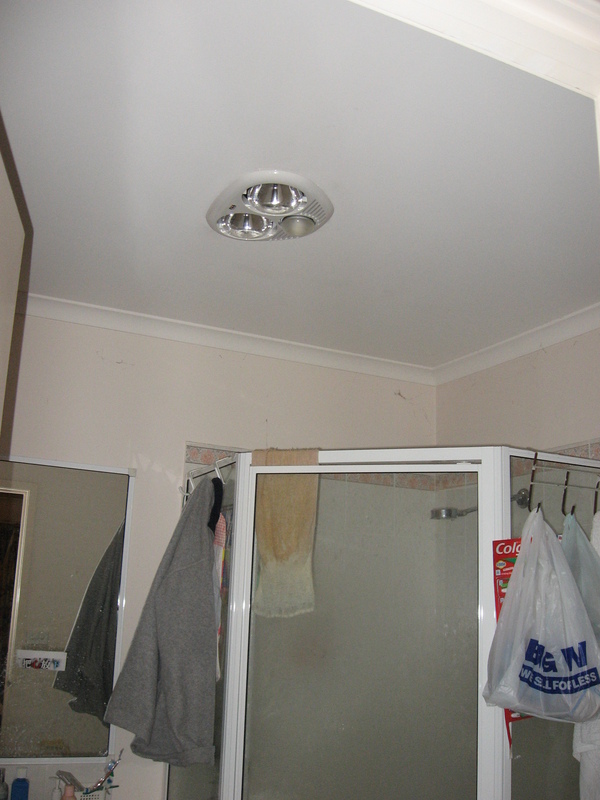 The top one even came from an Australian lighting manufacturer, Pierlite. All of them were early 90’s manufacture from the internal date coding, so they didn’t have a “bad” life, seeing at least 20 years of service. Because I had to hand-carry them home, I didn’t decide to take more than two, but they did come in handy when I wanted to test the LED retrofit tube side by side. While I didn’t take home the whole set of fittings I came across, I did manage to take home enough Philips Lifemax tubes for all the fittings, and I salvaged all the “used” Philips S10 starters. It might not seem particularly meaningful, but all I wanted to do was to take them home, test them and wire them up. 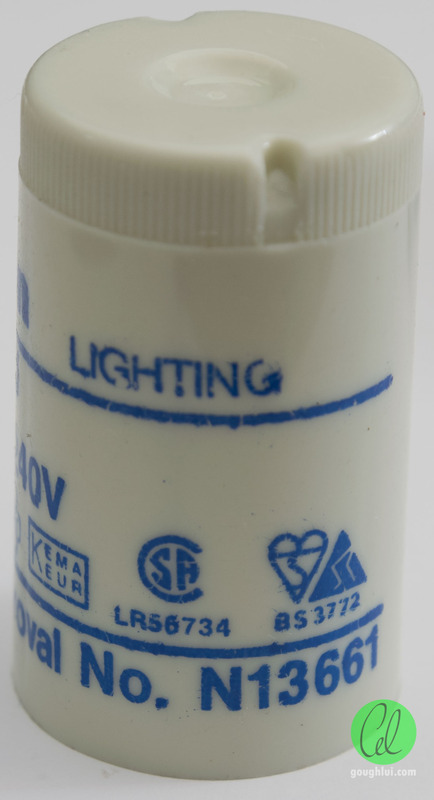 It might sound a little crazy, but as a child, I really loved tubular fluorescent bulbs. 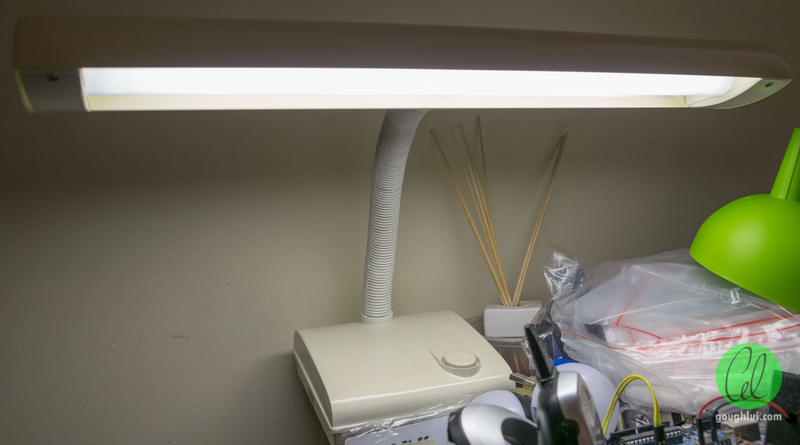 Maybe because it was something exotic to me, because most of the house was running either regular filament globes or Philips PL-style compact fluorescents which just came on reliably after a slight one to two second preheating delay. The only places where I would see them was in street lighting (although that was quickly phased out, as the dead ones liked to cycle annoyingly) and in commercial buildings where they’d remain running for long periods. The blinky nature of the pre-heat inductive control gear was something to behold. It wasn’t just the few flashes it gave off as it was starting up, along with the hum of the ballast and the “tink-tink-tink … tink” sounds emitted by the tube were fascinating. 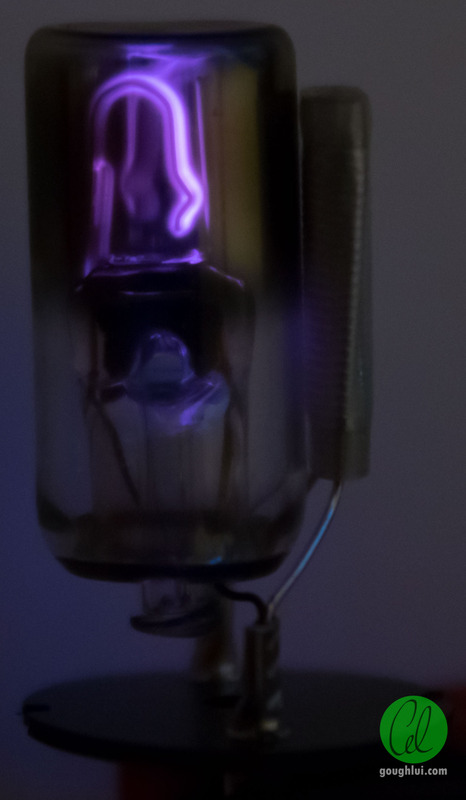 I didn’t know why at the time just why the tubes did that, but I noticed a warm tube recently run usually didn’t flash as many times as a cold tube, and that really got me wondering just what the hell was going on inside and why regular CFLs didn’t do that. 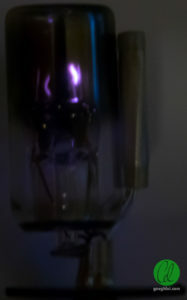 We did have some prismatic jar style early fluorescent retrofit globes that weighed more than a kilo that did the “flashy dance”, and I remember being quite fascinated with them too, watching a feint purple glow being emitted just before the tube lit up (see the middle lamp in a home-built lighting demo rig which I’m still using in the house today). 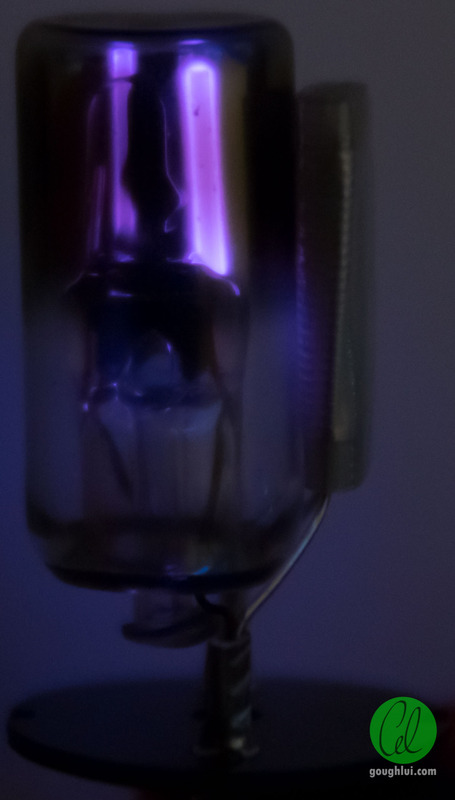 Ultimately, what I was witnessing was the glow of the starter switch tube itself, and the blinkiness was all due to the crude “random” nature of the pre-heat time and striking voltage action of a starter unsynchronized with the mains. 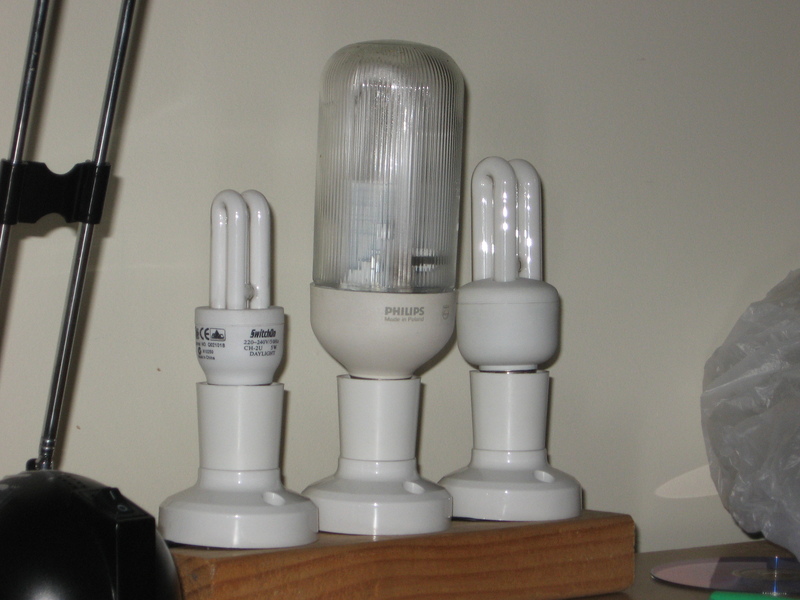 The programmed start of the CFLs were superior in terms of annoyance and tube lifetime, but much less exciting. Regardless, I had always wanted to get myself a fitting to play with. When I was young, I remember visiting the local hardware shop and I’d ask my parents to buy me one. They never did, noting just how ugly and silly it seemed. I didn’t give up at that, so eventually, I salvaged one. I didn’t have too much electrical knowledge at the time (2003), but I salvaged an 18/20W single unit with inductive control gear and converted it into our “bedroom” light by wiring it into a bayonet cap plug with a flex that left the earth disconnected. While the light was a metal chassis, nobody would touch it … so I didn’t think that was too bad. 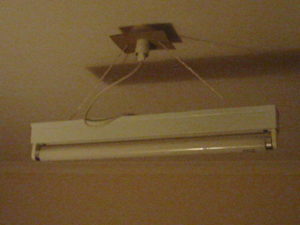 I suspended it off a piece of stiff cardboard with two pieces of nylon rope, wedged into the lamp-holder socket. It worked, for many years, until I moved out of the house due to high school requirements and desired to bring it along with me. It gave my room a bit of a “workshop” feel, but I liked it quite a lot. 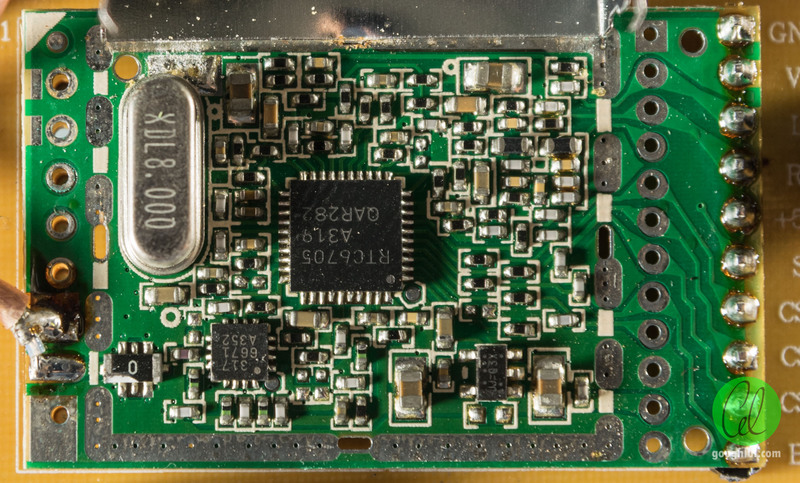 Later on, the PFC capacitor on it failed, first with a lot of internal arcing and crackling, before I decided just to cut it loose and remove it. I reasoned it wasn’t an “essential” item, and it could run without it, and I was right. I still have this fitting in my wardrobe today, and I’m still pretty fond of it, because it represented wish fulfillment. In fact, I would have to credit salvaging things as one of the main reasons I pushed myself to learn a lot more about electricity in my own way, and to have the confidence to play around with things freely without thinking about financial consequences if I broke something. 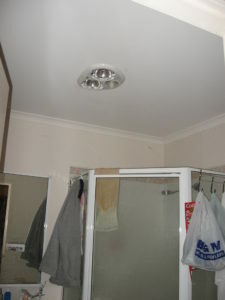 My Dad had purchased a combination bathroom heater-light-fan unit well prior to moving into the house in about 1997 or so but never installed it. 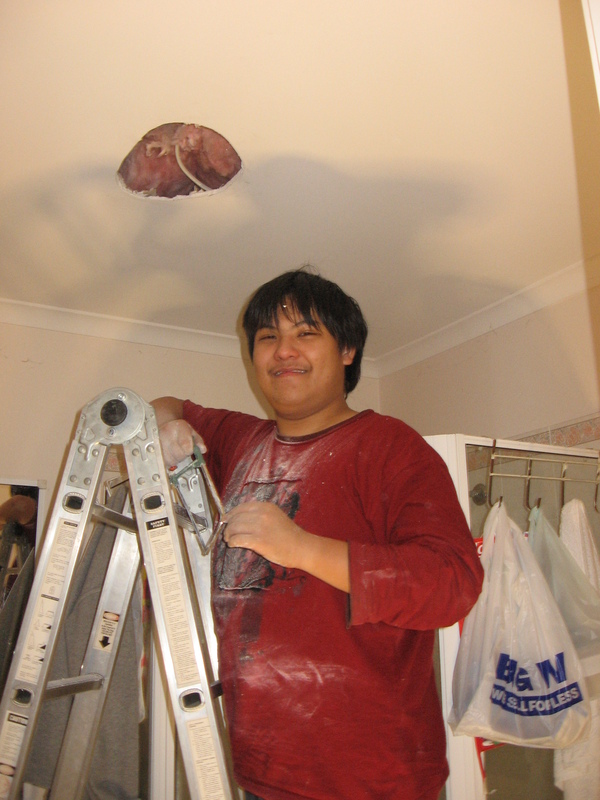 Ten years later, I got around to installing it – first by mocking it up within its own box suspended on milk crates to show that I had the wiring correct and could get it installed properly, and then, actually putting it into the ceiling. Would I actually recommend people to just go out and do these things? Of course not. Jumping into the deep end is dangerous – but growing your knowledge and having little accidents along the way is more likely to be a route to long term success and less risky overall. In the ten years the unit sat in the garage, not once did anyone had any inclination to call and pay for an electrician to put it in. It was an option, but it wasn’t one we wanted to take partly due to price. Instead, I chose to put it in as a gift to my Dad as it was winter-time at the time, and as a challenge to myself to prove that I could do it. 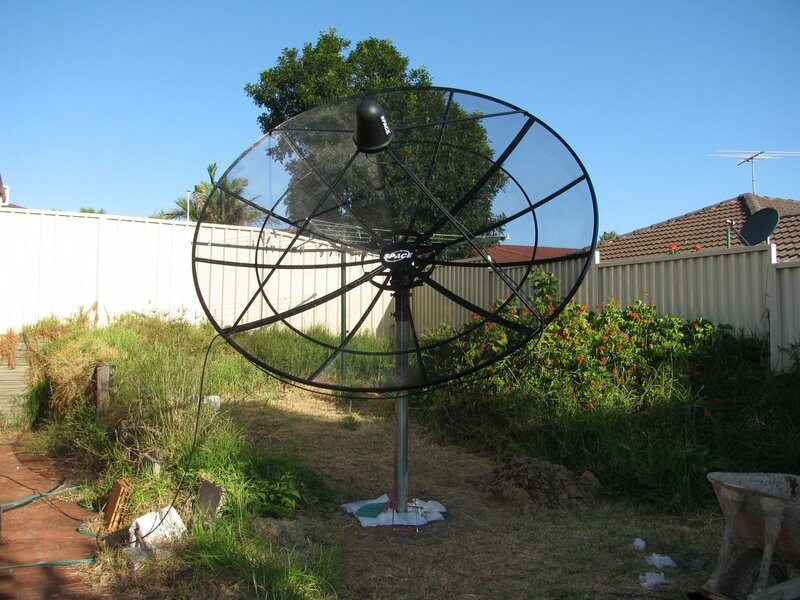 It was the same reason I ended up putting up a 2.4m satellite dish in his backyard in Feburary 2011 – one that’s still perfectly operating today. The pole wasn’t quite perfectly vertical, but that’s all part of the learning experience. I suppose that having the right motivation can go a long way to getting things done, and extracting the most from it. However, salvage is a double-edged sword. The big downside is that the salvaged goods are in an unknown condition. To advocate playing with potentially dangerous goods would be irresponsible, but sadly, I think many people do pick things up off the street and just plug it in and “see what happens”. A terrible idea. To practice safe salvage, it’s at least necessary to do some basic safety examinations – really basic things like cleaning up the unit and examining the casing for cracks or protruding wires, checking if the flex cord insulation is intact from the plug to the unit, taking a peek inside to see if there’s any burnt/charred bits or violently opened fuses or foreign objects that shouldn’t be inside. Even then, it’s probably wise to familiarize yourself with the equipment, its principles of operation and what to do in case of an emergency. Only then, is it a good idea to potentially apply power to the unit. You could plug it into your home power-point and power it up carefully, removing power in case of any abnormal conditions. However, this is pretty crude and dangerous – the mains can deliver a very high fault current, and tripping an RCD or breaker is inconvenience to the whole family. You could use an isolation transformer, but then, you could end up receiving a lethal shock without any protection (do not hold the appliance in both hands at the same time!) Instead, I now tend to use a 300W sine-wave inverter hooked up to a lab bench supply – it’s a very limited current source (about 2A peak current on the AC side) and shuts down in case of overload. 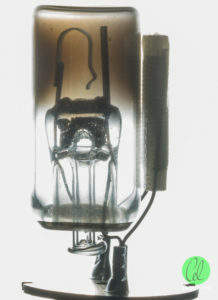 Other servicemen tend to use the filament-light-bulb in series trick, which acts as a current limiter in case of a shorted appliance to avoid damage to the appliance. It can still deliver a lethal shock, but I take other precautions too. Because I was lucky enough to have RoadTested the Keysight U1461A, I use its “megger” insulation resistance tests regularly to check the quality of the insulation of the gear I’m picking up. Primary-to-secondary and live+neutral-to-earth tests will reveal if there are potentially dangerous leakage currents that would imply that the insulation is internally failing, and is similar to the whole “electrical test and tagging” safety regimes in workplaces. Of course, such gear can be expensive, but a basic megger like the Tenma unit isn’t, and can tell you when things are unsafe. 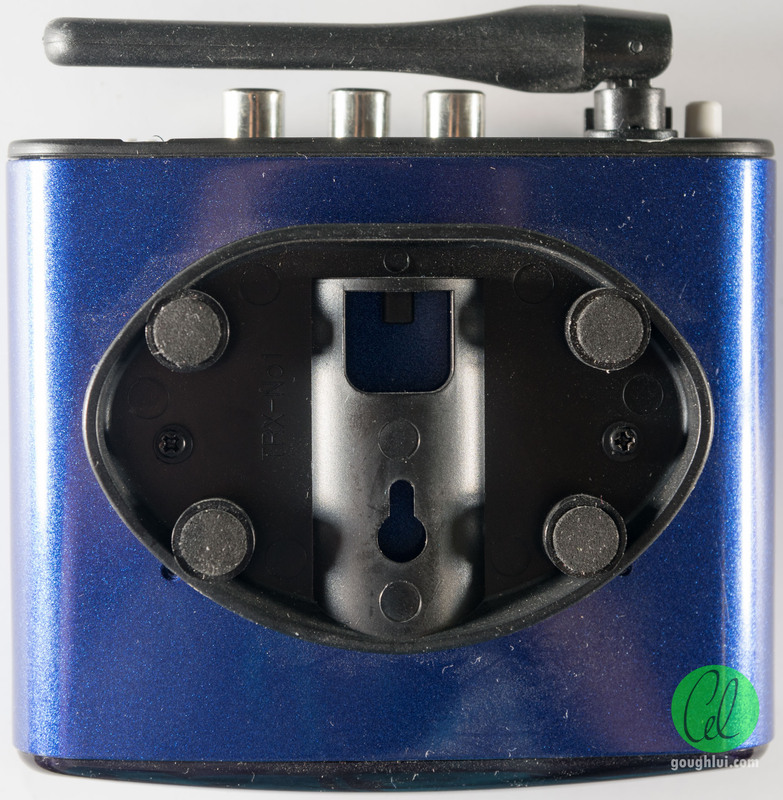 Using it properly is vital – otherwise you could end up damaging your salvages by applying voltage in the “wrong” way. 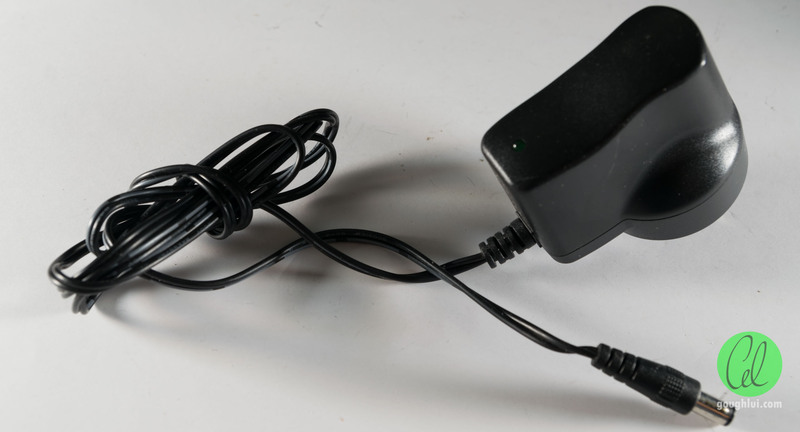 Non mains-powered appliances tend to be safer, but the downside of not doing your own due diligence and carefully setting up your test bench is the potential that you could plug something in and it could cause your own equipment to be damaged. Think “killer USB” style – you never know what you’re getting, so it pays to take a peek inside first. Luckily for me, both ballasts once wired up had good insulation test results and generally functioned okay along with the bag of starters I salvaged, making them the first double-bay 36W 4ft units I’ve owned. One of the chokes seem to put out an abnormally low cold-running current, making it a hard start compared to the others, but once warmed up, seemed to under-run the tube only marginally. This might be suggestive of manufacturing issues, or “abuse” where a failed tube was not removed in time and the ballast was left to be damaged through constant high temperature operation. I wanted to go out and grab another one to see if it was just this particular choke … but when I got back to the place where I had salvaged them, they were gone. No matter, since I had more salvages to smile about. 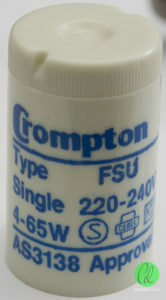 This is a Crompton Norax 2000 fluorescent desk lamp. It too uses the preheating method and inductive control gear. It’s decidedly retro, in a yellowed-beige plastic. But when I received it, it wasn’t working. This is another key point of salvage – with condition unknown gear, you should never count your chickens before they hatch. You might see something is in visually good nick, but the item’s practically dead and unsalvageable. Often, the previous owners may have done a certain level of troubleshooting to try and repair the gear. You should always go in with an expectation that nothing is workable, so if you manage to fix anything, it’s a bonus. I suppose, this is one of the gifts of salvage as well – it cultivates trouble-shooting skills. In order to repair something, you need to first develop at least a basic understanding of the components within a system and how they interact. The better you know the system, the faster and more successful you are likely to be at repairing it. It also forces one to push their skill when it comes to soldering, terminating wires, testing, etc to improve the chances of success and maintain the necessary safety. Better still, it opens your eyes to practical failure modes, and sometimes the biggest reward is a failure mode you didn’t expect at all. In the case of the Norax 2000, there were two faults. The root cause of the fault is the humble starter itself. This was a universal starter from Crompton, so it’s likely to be the one that was bundled in with the unit at manufacture. It’s likely as a desk lamp, the unit didn’t see too much service, as the tube is also Crompton branded. Taking the starter apart reveals nothing untoward. 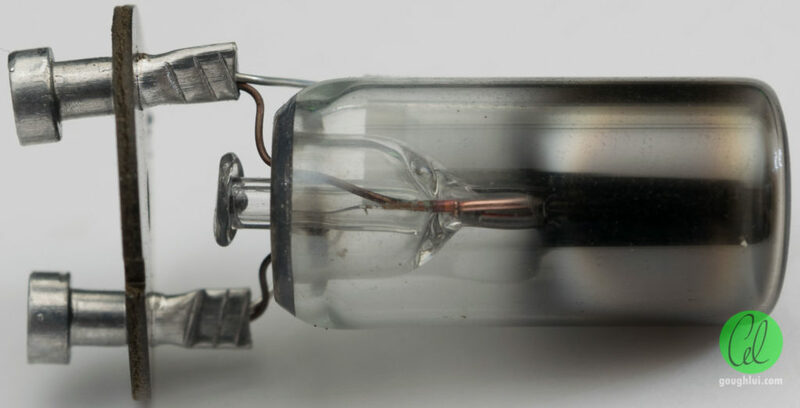 Visually, it looks intact, and the silver-coloured deposit on the inside of the glass is a result of sputtered metal as a result of the switching operations it has endured and running the arc within the tube itself. 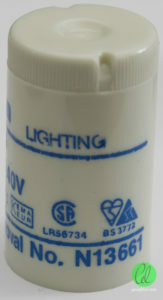 Holding the bottle in front of a flash shows the old fashioned “bent and stationary” contact style starter. However, this was only one of the failure causes. In fact, I will come back in a moment to explain what is the likely cause behind this failure. But there was a second failure caused by (likely) attempted troubleshooting. A common cause for non-functioning fluorescent lamps is poor pin contacts at the ends. To try and remedy this, the previous owner seems to have tried to give the tube a twist while the end caps were still fixed. Because of the design of the Norax, it’s hard to know when the pins at the end are in their correct position as the end caps are covered. A cost reduction measure had the end brass contact strips put over plastic rather than a proper socket, and the twisting action dislodged one contact from its support rendering it open circuit. So even if the original fault had been identified by its previous owner, replacing the starter would not have solved it because there was a second fault. It may have been disposed because it just “wasn’t fixable” to them. After all of this, the lamp works, and the story ends there, right? It could. But it doesn’t have to. Sometimes, it’s fun to do a post mortem analysis as well. 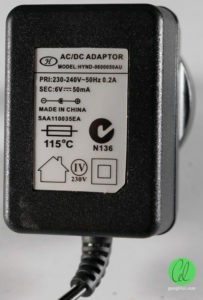 When subjected to DC from the U1461A, the starter does form a discharge within although the discharge is weak and localized. It occasionally forms a “third” mode of discharge to the right between the tip of the contact and rod. But most strikingly, the starter made an odd hissing noise as it was doing this. Most other starters tested in the same way were silent, and had a nicer glow. In the three discharge modes shown above, the 1mA breakdown voltage across the gas was 220 to 270 volts. Normally for a universal starter, the voltage should be about 140-180V, so that it’s well conducting (20-40mA) even at a “low” line voltage (e.g. 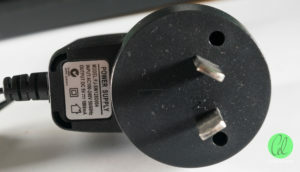 220V – 10% = 198V RMS or 280V peak). The higher discharge voltage of this starter, while still less than a healthy 230V supply, may mean that insufficient current flows in the gas when the ballast voltage drop is accounted for, and thus the bimetallic strip contacts never heat up enough to touch and initiate the starting cycle. The increase in the breakdown voltage may be because of a “leaky” glass-to-metal seal around the leads, which has let atmospheric air into the starter, increasing its breakdown voltage. It’s not “fully” opened to air, otherwise, I’d expect to have >1kV breakdown voltage. So definitely an interesting case – not a welded starter, not an “open to air” starter, but something in-between. 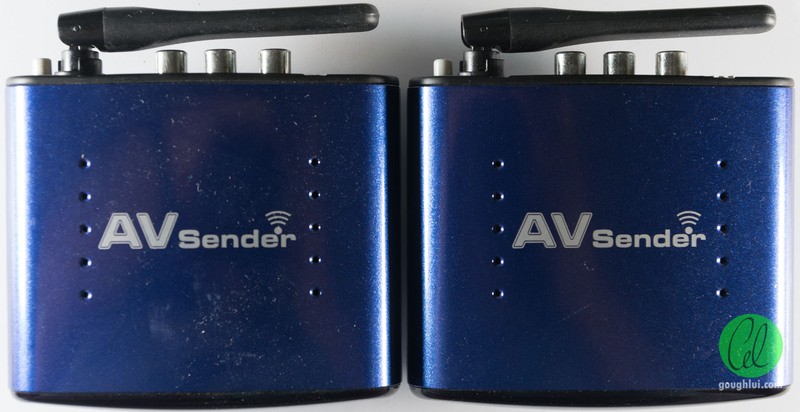 First-up here is a pair of 5.8Ghz AV senders. 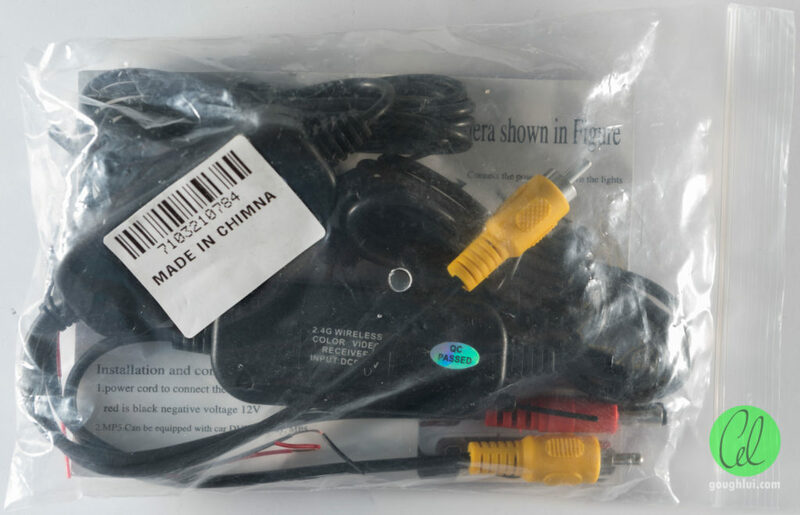 This is the sort of equipment you might use if you have a TV in one room and a cable box in another, and you want to link them together without investing in a long set of wires. Otherwise, maybe you had one cable box and you wanted several TVs to show the same picture. Anyway, I never really “had” that problem to conquer … but I’ve always wondered what’s inside these units. These units seem to be a newer type – they use 5.8Ghz, rather than the crowded 2.4Ghz, so they’re likely to be more friendly to Wi-Fi networks. They seem to have a potential provision to extend IR remote control signals too, but this model was built without it. The unit has rubber feet and a fixed antenna, and requires a 5v/1A power supply (which I found just one of the two in the same pile). It takes in composite video and L/R audio through RCA jacks. 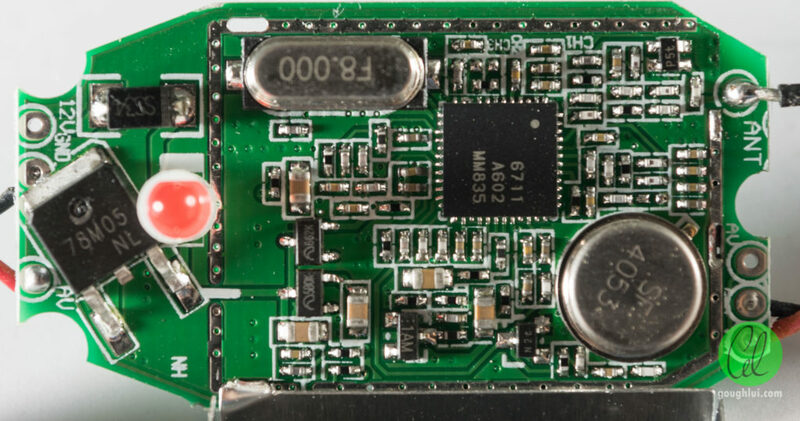 Both units were made by Pakite, using a single sided paper-type PCB that’s pretty bare save for the transmitter or receiver module which is housed inside a can. 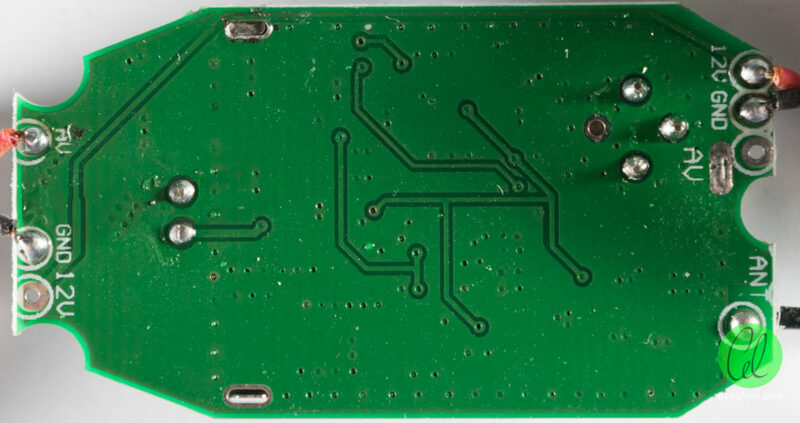 The two PCBs are different, to accommodate different ASK 433.92Mhz transmitter/receiver module footprints for IR remote extension, but have none of this equipment fitted. 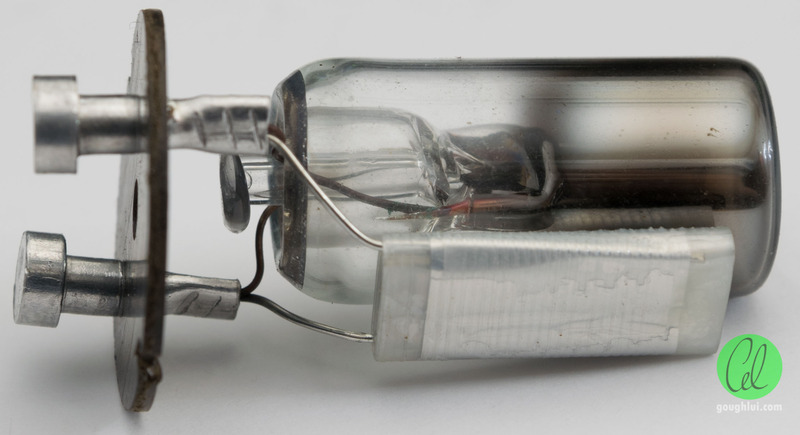 The capacitor on the transmitter seems a little bulged, so maybe it’s been running all the time. 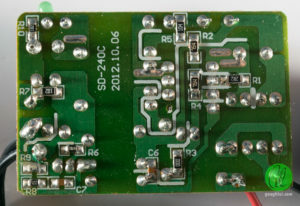 The underside of the board has solder mask, but very few components fitted. There seems to be a printed graphite strip over the channel selector traces to the dip switch, which seems like an acknowledgement that they probably should have been RF screened with ferrite beads, but they just didn’t accommodate it. I’m not sure if this approach is even effective. Module connections for both modules are very simple – Ground, Video, Left Audio, Right Audio, 5v, a pin labelled S that appears unconnected (select?) and four channel select pins for the DIP switch on the rear. 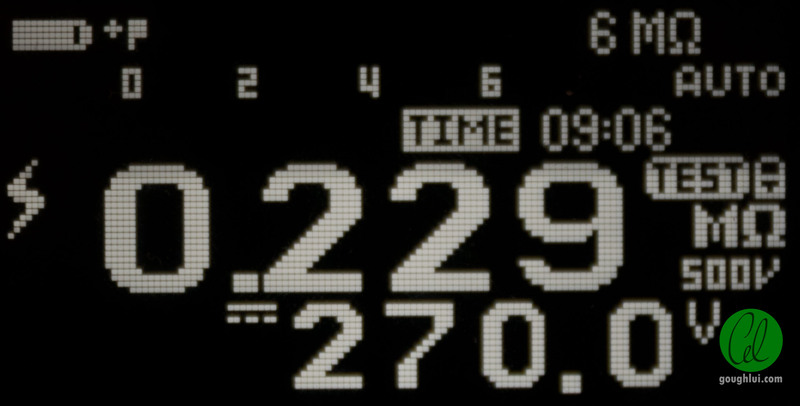 The transmitter uses a RichWave RTC6705 FM transmitter. 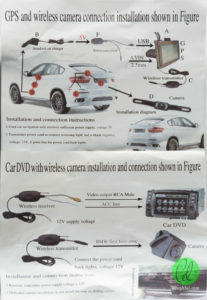 The receiver uses a corresponding RichWave RTC6715 FM receiver. 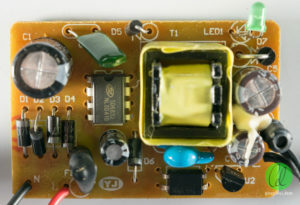 Both transmitter and receiver use an 8Mhz reference, and the receiver appears to have an additional SAW filter and two ceramic resonators/filters. The unit came with a generic Chinese looking power supply, but with a C-tick approval on it. 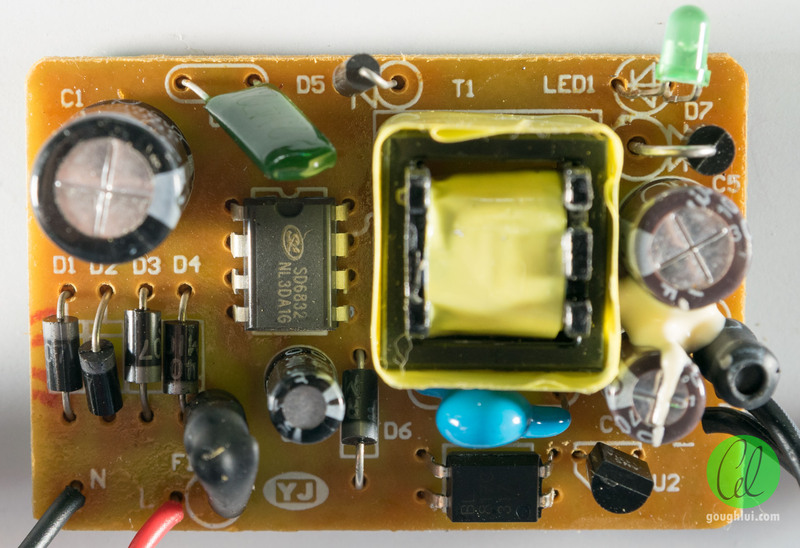 Despite this, the supply has opto-isolated feedback, interference suppression capacitor from primary to secondary, a good isolation gap between primary to secondary, a secondary side inductor filter and a fuse. 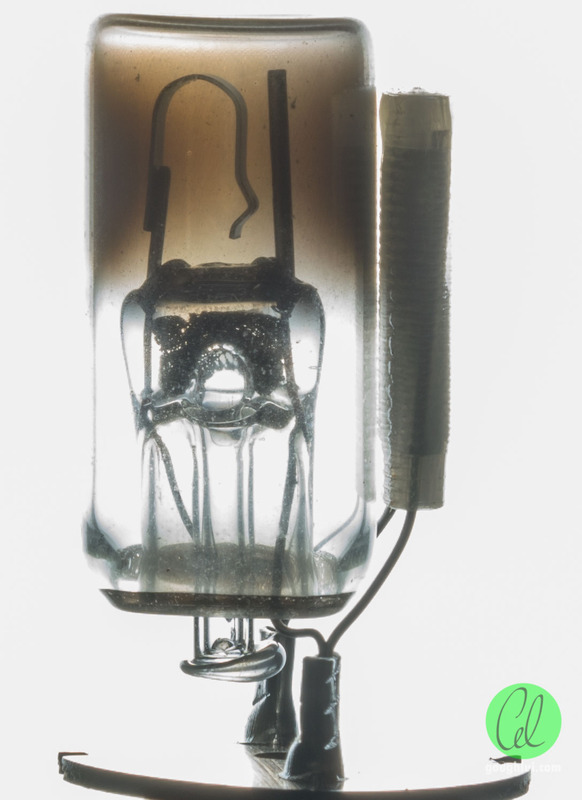 It doesn’t have any primary side inductive filter or safety-rated capacity for transient suppression. 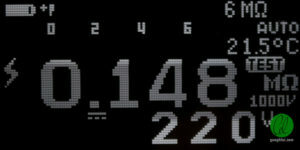 It’s based around a Silan Microelectronics SD6832. While I don’t have any immediate use for this unit, it’s probably a good thing to have around just in case some day I decide to go around and see if I can pick up FPV drone racing video feeds, or video from wireless house security, baby monitors, cable boxes, etc. Not that I’ll ever really have the time for it. Maybe I’ll see what the modulation looks like “on the air” once I reassemble it – one of the antenna wires needs resoldering after it snapped off during the teardown. 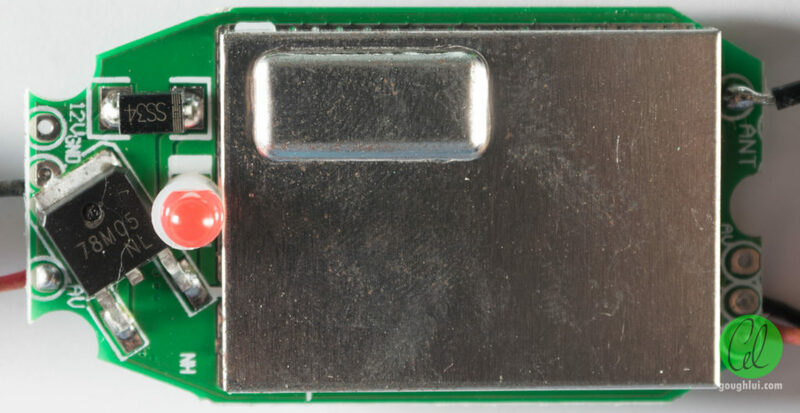 … a very small 2.4Ghz wireless colour video transmitter. 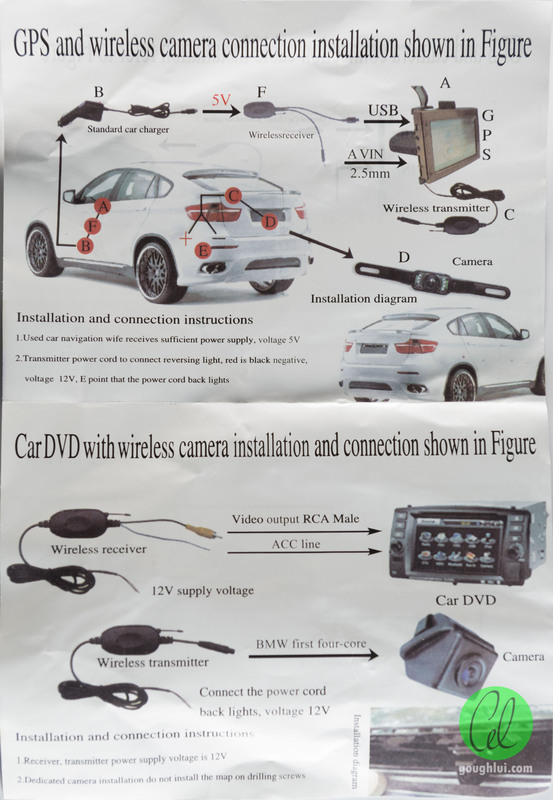 I’ve always wondered how the aftermarket reversing camera kits managed to get their video up to the head unit – instead of wiring it up, they just wire up a transmitter at the rear and a receiver at the front. 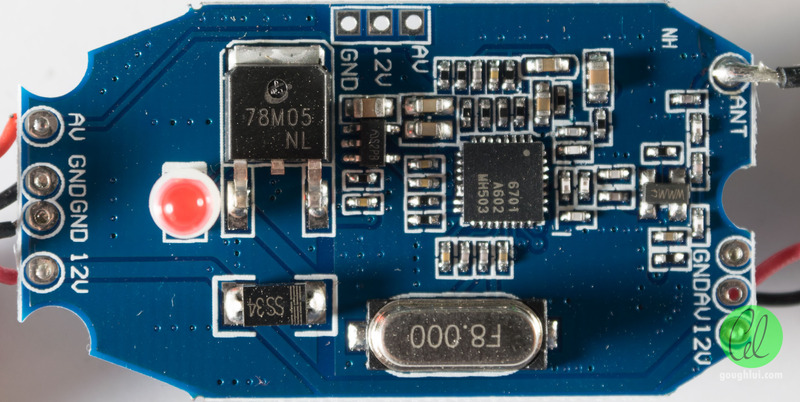 The board is very simple – there is no provisions for audio, and it has a linear 5v regulator as well. 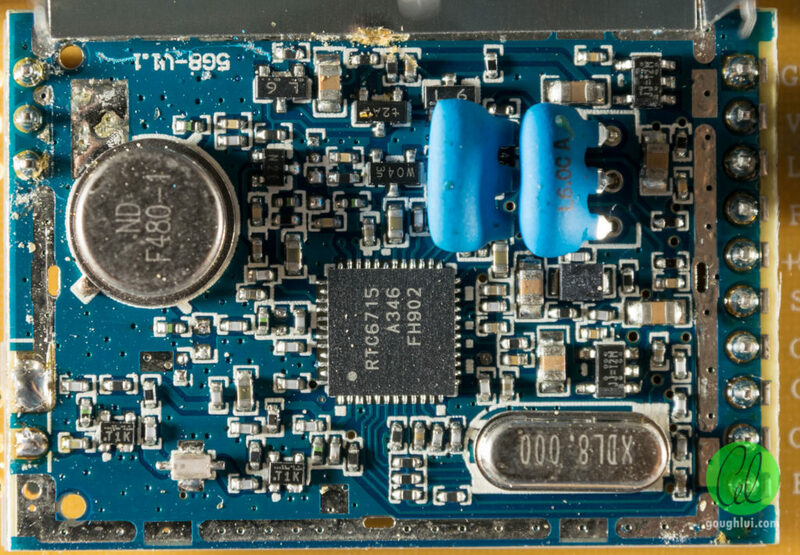 The chip is actually an RichWave RTC6701 FM transmitter with provision for two sound channels … do they have a monopoly on this market or what!? It includes some rather slap-dash instructions with lots of images which probably don’t apply and isn’t too easy to comprehend. 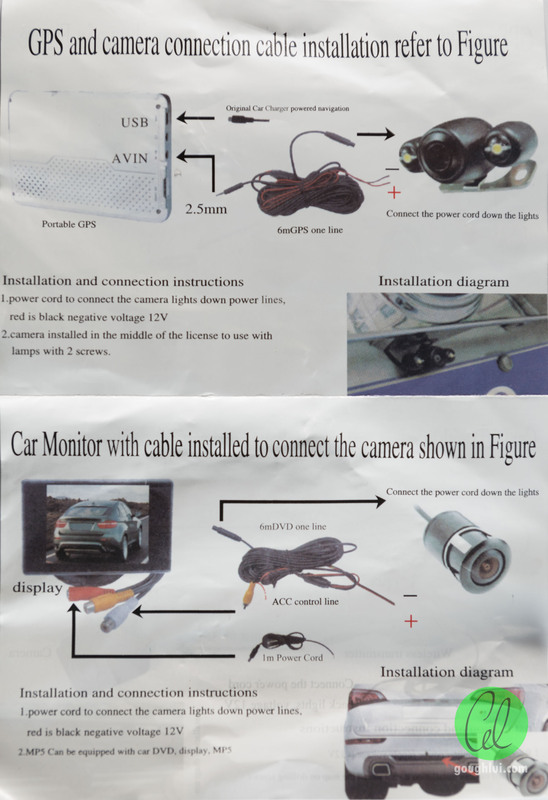 Regardless, it seems that you can just wire the reversing camera into the reversing light circuit so the transmitter and camera are powered up when reverse gear is engaged. 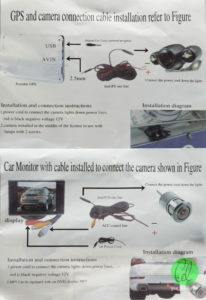 The receiver can be powered from an accessory circuit from the front all the time, and the screen can be switched to AV-in to see the video from the rear. There was an unused transmitter and receiver, so lets take a look inside the corresponding receiver. Predictably, it’s a RichWave RTC6711 receiver, with a SAW filter. It seems rather interesting that in both AV senders, the receiver board and transmitter board appear to be made by different entities. A bit curious I reckon. This set also does not have any channel selection switches open, thus there’s a good chance that if several people were transmitting at once, all that would be received is a tone resulting in no image. The rear of the board is pretty devoid of parts. Another salvage was this linear-transformer-based wall-wart. 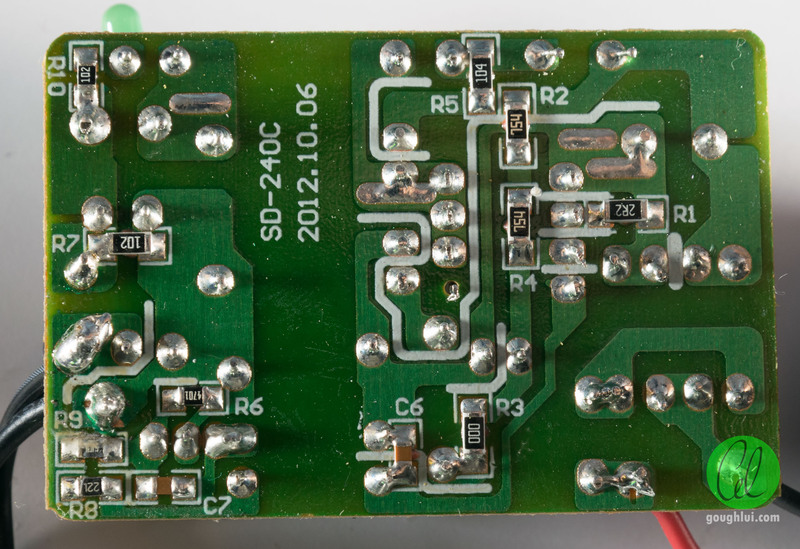 I wouldn’t have salvaged it if I had the time to check its rating first – 6V at just 50mA. This seems like a wall wart to trickle charge a very small battery, but its rating is so puny that it really can’t do much. This post took a bit of a philosophical diversion, but I think that was for the better. 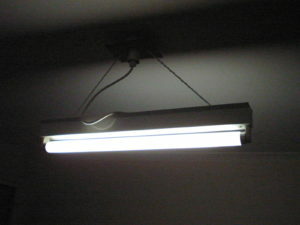 Sure, fluorescent linear tubes don’t get much love nowadays, but I still like them. I can definitely credit salvage as one of the drivers for my self-education and interest. Old standard definition composite AV stuff doesn’t get much love either, but I can’t say I like them much. We’re in a more digital, high-definition world now. At least I got to see inside them, and I didn’t have to pay for the privilege. The salvages don’t end here. There is another post to come … although, there could be more if I have the time. This entry was posted in Electronics, Lighting, Salvage and tagged lighting, random, salvage, teardown, tested, video, vintage stuff. Bookmark the permalink.